Nancy Nikolaeva Karaboycheva is Miss Bulgaria World 2013. Her height is 170 cm, measurements: bust - 90, waist - 67, hips - 90. "I am from Bulgaria, a beautiful country in Europe. I am very proud to be the face of my country and I will do my best to present it well at the Miss World contest. The cause I have chosen to dedicate myself is to fight against violence and ignorance towards animals as well as the attempt to find their homes. A little bit about me – I love being with my friends and doing a variety of sports. I was a volleyball player and I’m very discipline person. I dream to travel all over the world. I also like drawing caricature". Maria Velichko (or Maryia Vialichka) is Miss Belarus World 2013. Her height is 177 cm, measurements: bust - 86, waist - 60, hips - 92. Maria is currently enrolled in a 5 year degree of Veterinary Medicine at the Vitebsk State Academy. An animal lover, Maria recently worked to save homeless animals in her home city as part of the ‘Take Me Home’ charity scheme. Her hobbies include playing chess, reading books on astrology, and listening to rock music. Her favourite food is Belarusian Cuisine. Maria describes herself as an open and cheerful person, and her personal motto is “Never Give Up!”. I’m Maria Velichko. I feel very proud and fortunate to be representing the Republic of Belarus, a country with a long history and a great culture. Belarus is a land of vast plains and picturesque hills, thick forests and green meadows, deep blue lakes and flowing rivers. I was born in the small beautiful festival city Vitebsk. I’m 22 years old. I am a doctor of veterinary medicine. My profession spiritually enriches a person, gives a sense of kindness, love and care. I’m interested in astrology, my hobby is hand-made. I very love my family and friends. I believe in myself and I know that world gives a road for those who know where he is going". Hillevi Rombin (September 14, 1933, Uppsala, Sweden – June 19, 1996) was Miss Sweden and Miss Universe in 1955. She grew up in Uppsala, Uppland and was the Swedish national decathlon champion before she competed in the pageant. A remarkable athlete, Rombin excelled in gymnastics, track & field, and downhill snow skiing. After winning the pageant, she left Sweden for Hollywood to fulfill her acting contract with Universal Pictures, part of the prize package as Miss Universe. She studied acting along with John Gavin, Clint Eastwood, and Barbara Eden, among the other contract actors. Universal put her in a couple films, with just one or two lines, to give her some exposure and experience. She was credited for small speaking roles in two films. In The Benny Goodman Story (1955) she asks for an autograph and in Istanbul (1957) she appears as a flight attendant near the film's end. During her year reign as Miss Universe, while traveling around the U.S., she met her future husband G. David Schine, whose family was in the hotel business and would later himself be in the film and music businesses. She discontinued her acting career in order to focus on married life, soon starting a large family with Schine. They had six children, and their marriage lasted almost 40 years until their deaths together in 1996. 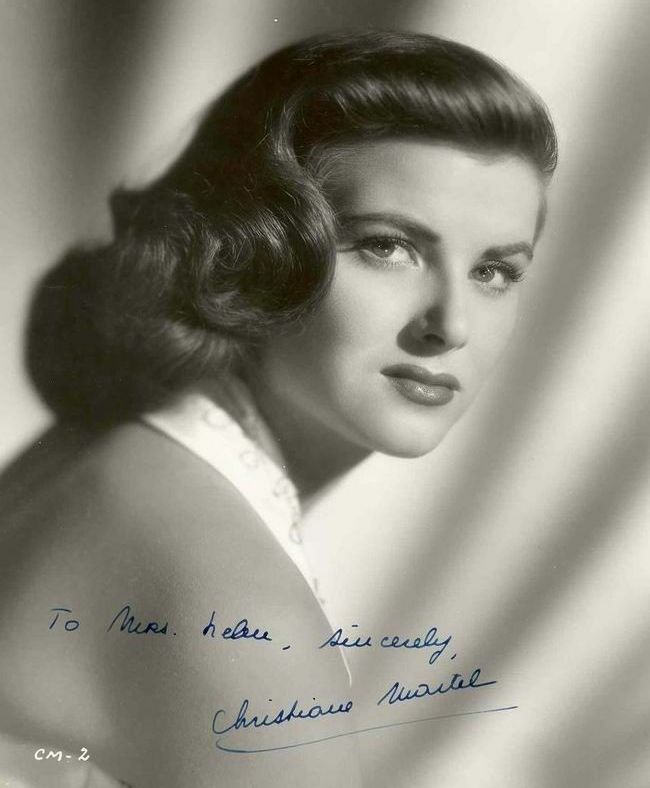 Christiane Martel (born Christiane Magnani; January 18, 1932, Paris) was actress and Miss Universe 1953. Armi Helena Kuusela (born 20 August 1934, Muhos, Finland) is Miss Universe 1952. In 1952 she won the national beauty contest Suomen Neito and was presented with a trip to the United States to participate in the first-ever Miss Universe pageant, becoming its first titleholder in history. At her crowning she was only 17 years old. At the time she weighed 49 kg (108 lb), and her height was 1.65 m (5 ft 5 in). Emmelie de Forest (born 28 February 1993, Randers, Denmark) is a Danish singer. She represented Denmark with the song "Only Teardrops" in the Eurovision Song Contest 2013 in Malmö, Sweden. Emmelie's full name is Emmelie Charlotte-Victoria de Forest. An important part of Emmelie's stage performance has always been her footwear - or the lack of it. "I have always preferred singing without wearing high heels or shoes. Being barefoot makes me feel closer to the ground, the earth and makes me feel more relaxed", Emmelie says. Emmelie de Forest won the Eurovision Song Contest 2013. Stephanie Tency (born 12 December 1990, Amsterdam, Netherlands) is Miss Netherlands 2013. She will represent her country in the 2013 Miss Universe pageant. Stephanie Tency's real name is Stephanie Apcar. Her height is 173 cm. Jeanette Borhyová is Miss Universe Slovenskej Republiky / Miss Universe Slovak Republic 2013. Her height is 172 cm. Zlata Ognevich / Злата Огневич (born January 12, 1986, Murmansk, Russia) is a Ukrainian singer. She represented Ukraine in the Eurovision Song Contest 2013 in Malmö with the song "Gravity". Her real name is Inna Bordyuh / Інна Бордюг.